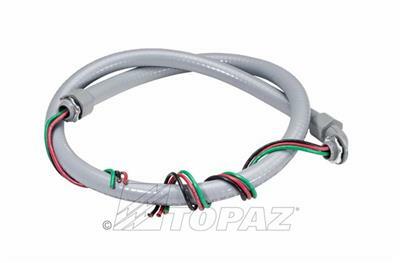 Topaz’s AC Whips are designed for reliable use as a connection between air conditioning unit and electrical power source. Recommended for use to connect compressor to AC disconnect box. Cable consists of insulated connectors inserted into non-metallic conduit. Easy to install 4 and 6 foot lengths; resistant to damage from oil, water & sunlight. UL listed.